I have just found this image created from The Starry Night by Vincent which I included in my recent blog (Amazing what 123 years can do!). So had to share it with you and have also inserted the real painting so you can see the difference. 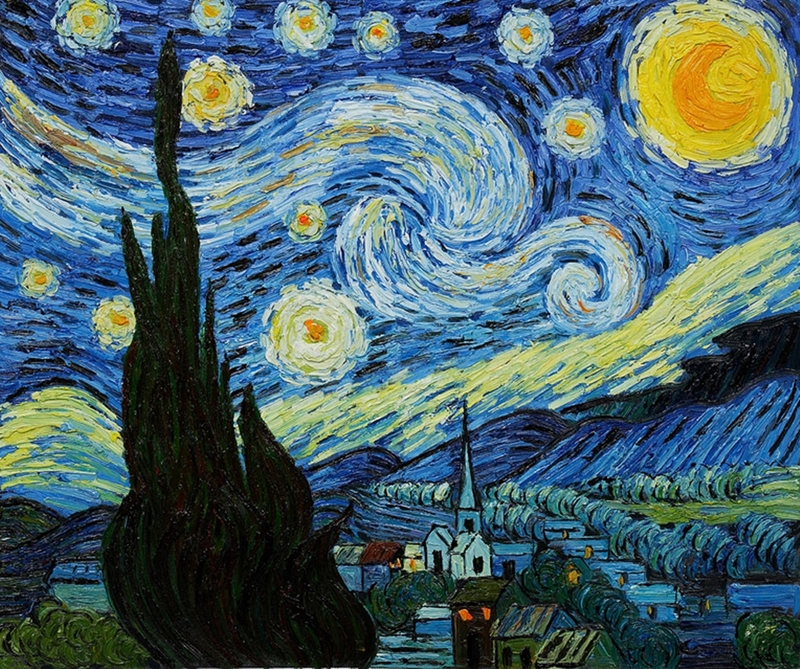 We’ll never know exactly what Vincent Van Gogh saw that inspired him to paint “The Starry Night,” but Alex Ruiz takes a delightful stab at guessing in his digital interpretation of the night that famous work was born. The size of the objects has been altered to lend a mystical quality to an otherwise realistic work, but what’s art without a little magic? 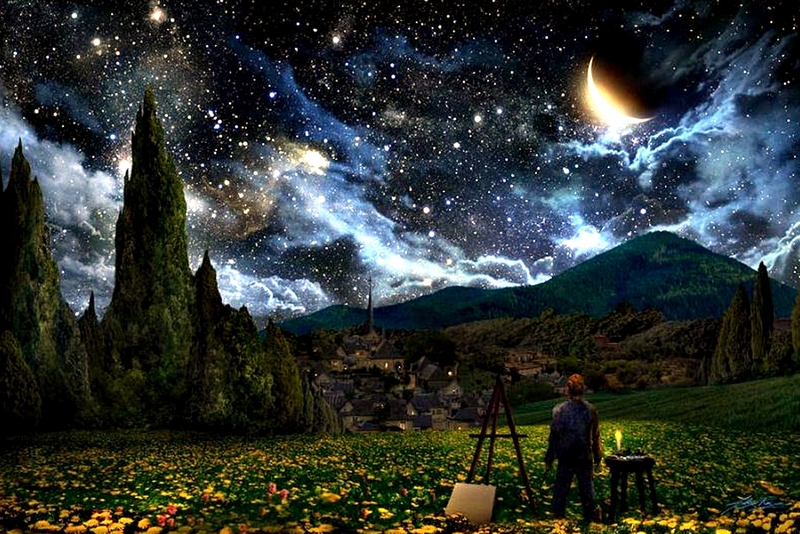 Digitally reimagining the night of Van Gogh’s “The Starry Night”. I really like this interpretation picturing Van Gogh FREE (free of asylum, free of mental disease) and being mesmerized by the beauty of the night and nature vs. knowing the real story of creation of this amazing master peace. How cool. Thanks for sharing! Both pieces are lovely but I think the second more real and yes, both are magical! Magical describes them very well. hey, both pictures are so magical to me, I just wonder how he do it ? van Gogh is very special to me and this quote breaks my heart…it is not hard for me to imagine his way of seeing and I too have wondered why people invariably see stars as brights white objects! far from it…..thank you. How fun to see the comparison. Thanks for posting them. We forget how much night world we have lost through “light pollution” – how dark night was, how many stars you could then see, how mysterious and magical and often scary real darkness was. Both are nice, the original is the one I’m most familiar with because you can see his style so clearly (which to me comes from the inner him… which yes, was probably influenced by drugs or mental illness), but I really like the 2nd one as well. It’s beautiful, and I like the idea of having him in the picture as if seeing it through his eyes, but it’s sorta like comparing apples and oranges. (to me that is) Each has it’s own distinct style and therefore both appeal, but for different reasons. 😀 Oh, also, thanks for visiting my blog recently. I do appreciate your time! Keli thanks for your comments about these images. I studied Vincent closely and believe his obsession to do something worthwhile in this world (he was a very religious man) consumed him and lead to mental illness. His art does touch us deeply because that is where it came from within him. As you say it is also good to see what possibly he saw on that night. Hi I love all his works. Another favourite of mine is his Sunflowers. My first memory of his works was in an art class at the age of 9. We were asked to choose one of his paintings to recreate. This was one of them I chose. Over the years it got damaged and thrown away. My older sister still keeps my Sunflowers in a frame smiling at everyone in her kitchen. It’s sad that pollution today blocks the beauty of the stars and the night sky, and his innocent playfulness is what I love most about his work. Thanks for showing this. It’s beautiful! silvermoonlight18 thanks for your comment. Vincent’s work has touched so many people in so many ways including you and me. Sad you lost yours but at least your sister still has Sunflowers. Maybe you should paint another now.